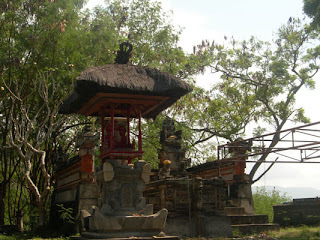 Pura Khayangan Jagat Pura Luhur Silayukti, located in the village Padangbay, Manggis Karangasem district, at an altitude of 25 m from the sea surface. This temple can be reached by motorcycle or car. Mileage from the district of Karangasem to this temple about 26 km, and about 55 km from Denpasar. The history of Pura Luhur Silayukti, related with a supreme pandhitaMpu Kuturan of religion named Siwa Buddha. He came to Bali is expected by the end of the 10th century. Based on the discovery of several inscriptions, ancient relics that are still contained in the Bali title also wrote the name of Pandhita Senapati Kuturan. Differences initial term or predicate that states that the Supreme pandhita it a double by profession during his lifetime in Bali. That is as religious clergy, experts philosophy, he was nicknamed by the people with the term "Mpu" and as a state structure experts he obtained his "Senapati" to sign his departure. Mentioned he Mpu Kuturan come to the island of Bali from the kingdom Kediri in eastern Java, with leaves up the kapu-kapu, wearing banda leaf screen or when, down by the sea of Bali, as well as facing the King Udayana Darmapatni Warmadewa at saka year or the year 915 BC and 993 go to silayukti, earthen village fields, on Wednesday Shiva, Wuku Pahang, in light of Saka 923 or 1001 years BC, and to build a heaven on the Mount Silayukti. The named Sila Yukti derived from the word 'sila' means'precepts' which means rock or base or foundation, while the word 'yukti' means courage. So Silayukti means he (Mpu Kuturan) provide or instill foundations of truth there. In the inscription Andatatwa explained that Mpu Rajakerta or Kuturan Senapati has made many changes in everything, ranging from the cult, introduced the use statues at Temple, he advocated the use of incantations in Bahasa Bali, and no longer use spells in Sanskrit. What a remarkable capability that is owned by Mpu Kuturan. Many relics of the Buddhist concept of adoration Ciwa are spiritual works really great for uniting the complexity of the genealogy of the Gods into simple concepts that are very easy to understand and lasting until now. In addition to the concept of Buddha is the largest Ciwa as described above as a reference for all Hindus worship of Dharma in the archipelago. Puseh dalem village concept as a continued application of the concept Ciwa Buddha. The concept of Catur Loka, the temple worship in each of Pura Kawitan, Dhang Khayangan Temple, Temple of Sad Parahyangan Jagat, and the last Khayangan Jagat. Forms pelinggih like Meru and so many other results of his creation, but Padmasana revised form by Dhang Hyang Nirartha which is also a descendant of him. Indeed the history of civilization center in Bali either in culture or cultural, social, political Silayuti centered in the area, because he mpu Kuturan foundations invested a lot of truth there. Jagat Pura Luhur Khayangan Silayukti, is a common penyungsungan temple as a place of worship Ida Sanghyang Widhi Wasa in its realization as Sanghyang Jagat Karana is the source of the origin of the world.